Police are calling it one of the worst cases of animal abuse they've ever seen. Two women are facing animal cruelty charges after investigators say they left a Shih-Tzu behind in a home they had been renting in Londonderry, New Hampshire. Animals welfare advocates say a bill they are pushing in Massachusetts would help prevent a similar tragedy. Lyn Gorka, a Re/Max realtor in Marlborough, took in her cat Willy after she says a client selling their home left him behind when they moved out of state. "Oh, it's devastating. To me, it's like leaving a child behind," says Gorka. Gorka has found many abandoned animals over the years: frozen cats, hungry dogs, and a rabbit thrown in the trash. But, it was Phanton, a two-year-old yellow lab, who was found starved to death in a Hudson condo, that drove her to take action. For the past five years, the 72-year-old has been a driving force to get an abandoned animal law on the books. In a bill being debated in Joint Committee at the State House, landlords and owners of foreclosed properties would be required to check vacated properties within three days for animals left behind. If they were to find any, they would be required to alert the city or town animal control officer. Dr. Martha Smith-Blackstone is a forensic veterinarian and performs many of the necropsies on animals who die of abuse of neglect throughout the state. Sometimes, she says, there is justice. 37-year-old Jose Rodriguez was convicted of animal cruelty in 2014 after police found the mummified body of his Husky named Snow in the bathtub. Rodriguez had left the dog in the Sheridan St. apartment without food or water and the landlord did not check the property until neighbors complained of the smell four months later. "They're clawing at doors and windows trying to get out. Eating foreign objects. Ripping up floor tiles, trying to eat them. There's been cases of the dog ripping up toilet seats to get access to water," says Smith-Blackstone. Lt. Alan Borgal with the Animal Rescue League of Boston says he sees between six and 10 cases of animal abandonment a month. Stitch, an abandoned, starving pit bull found in Dedham, had to be put down last month. 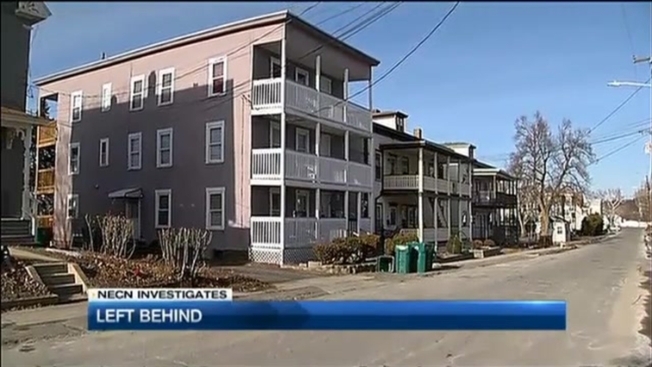 A month before that, police found two Chihuahuas in a Southbridge apartment. They had been locked in a closet, inside a rabbit cage, with no food or water for over a week. The mother and her puppy were rescued in time to save them. So far, no one has been charged in the case, but Borgal says the criminal investigation is ongoing. "I don't think people realize, if they abandon their pet, it's a felony. It's animal cruelty and it's a felony in Massachusetts. It's seven years in jail now," says Borgal. The bill would also impose a $100 a day penalty for landlords who don't check their properties after the required three days. Greg Vasil with the Greater Boston Real Estate Board wonders how much weight those fines will carry. "You can ding them, but then you have to find it and actually use the court system to recover it. It could take years," says Vasil. Smith-Blackstone says ideally, the person who abandons the animals will be the one punished, but finding the animal before it's too late must be the priority for everyone. "When animals are criminally abused, there's a very distinct possibility that humans are in harm's way as well," says Smith-Blackstone. The bill is sponsored by Democratic Senator Jamie Eldridge. He says he hopes it will receiive a favorable report in committee so it can move forward. An update is expected in mid March. As for the Chihuahuas abandoned in Southbridge, the Animals Rescue League says they are on the mend and have just been adopted.